Royal Canin Medium Adult 7+ is developed to meet the needs of mature medium breed dogs. This product is tailored to suit the nutritional needs of older dogs showing signs of ageing. A balance of nutrients and vitamins helps to support them inside and out, promoting healthy digestion, a glossy coat and good dental health so they can continue living healthily and happily into old age. This formula uses an exclusive balance of high-quality proteins and fibres that are easy on the digestive tract. Healthy digestion is essential for your dog to be able to get the maximum amount of nutrients from their food. Royal Canin’s formula is highly digestible and contains plenty of fibre to improve stool quality. As well as supporting them inside, Medium Adult 7+ also helps to promote a healthy, glossy coat. Enriched with EPA and DHA fatty acid, soothes irritated skin and protects the skin barrier. Added calcium also helps to protect against tartar build up to maintain your dog’s dental health. added calcium prevents and reduces tartar. As your dog grows older, they need a nutritional diet that will support their wellbeing. Tasks that were once easy may become harder for them and it could be hard to recognise the signs. To give them the best start in older age, your pet could benefit from a highly digestible formula to help them absorb essential nutrients and keep illness at bay. 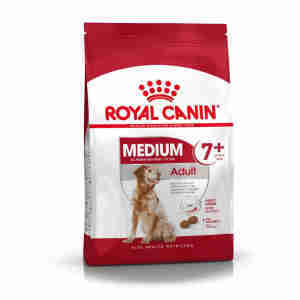 Royal Canin Medium Adult 7+ is developed to replace your dog’s regular food. Check feeding guides to make sure your pet is getting the right amount of food for their height and weight. If you notice any weight gain, adjust their food accordingly. Ingredients: dehydrated poultry protein, rice, maize, wheat flour, animal fats,maize flour, vegetable protein isolate*, wheat, hydrolysed animal proteins,beet pulp, fish oil, soya oil, yeasts, minerals, fructo-oligo-saccharides,psyllium husks and seeds, hydrolysed yeast (source of manno-oligo-saccharides),borage oil, marigold extract (source of lutein), green tea and grape extracts(source of polyphenols). ADDITIVES (per kg): Nutritional additives: Vitamin A:21800 IU, Vitamin D3: 1000 IU, E1 (Iron): 45 mg, E2 (Iodine): 4.5 mg, E4(Copper): 9 mg, E5 (Manganese): 58 mg, E6 (Zinc): 174 mg, E8 (Selenium): 0.07mg - Technological additives: Pentasodium triphosphate: 3.5 g - Preservatives -Antioxidants. ANALYTICAL CONSTITUENTS: Protein: 25% - Fat content: 14% - Crudeash: 4.9% - Crude fibres: 1.5% - EPA/DHA: 4 g/kg. *L.I.P. : protein selected forits very high assimilation. Provides my dog with great balanced diet and keeping him in great condition in his twilight years! Always bought it from original breeder's recommendation.